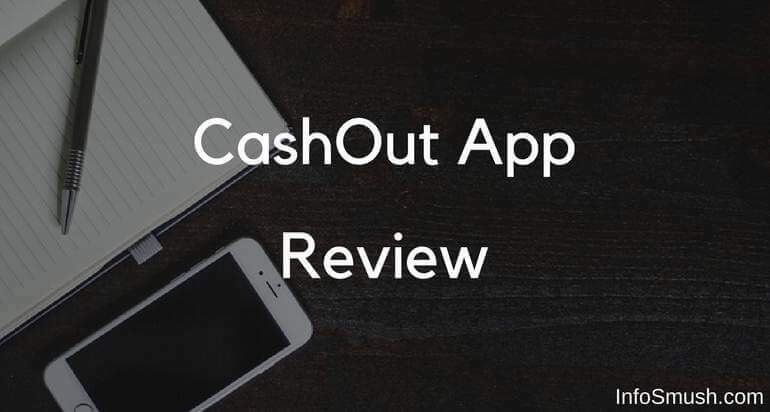 This review is about CashOut which is another app that lets you earn some extra cash by completing offers and surveys on your smartphone. You will earn Coins for every task(offer or survey) you successfully complete. CashOut is called Coins. You can redeem these coins for PayPal cash or other gift cards like PVR, Fastrack and more. CashOut app is available for Android devices. And users from almost every country including USA, UK, AU, and India can download this app and start earning cash. In the Top Picks tab, tap on "Enter Referral Code"
Your account will be instantly credited with 50 coins. On CashOut app you can earn coins by referring friends, Completing offers, watching videos, surveys. Complete the app offers from the list of offer providers including Fyber, Supersonic, AdscendMedia, and SuperRewards. Or you can download apps directly from the Download & Play tab to earn coins. If you are not familiar with app download offers: To complete these offers you need to download an app from Play Store or iTunes and keep it on your mobile for a certain time or just install and run. Some of these offers may also require you to make an in-app purchase. You can earn 10-150 coins per offer. On CashOut app you can also earn coins by completing surveys. For each survey, you can earn 50 to 300 coins. Surveys providers available on CashOut are Peanut Labs, AdscendMedia, TapResearch and Pollfish surveys. Complete offers like sign up or download and earn coins. 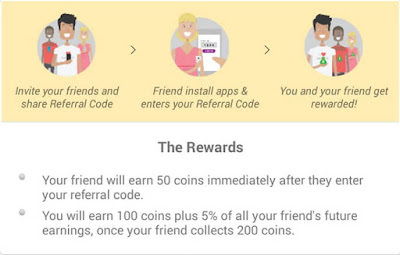 Every friend that enters your referral code gets 50 coins as the referral bonus. And you will earn 100 coins once your referral collects 200 coins plus, 5% of their future earnings for lifetime. E.g., You refer a friend, (say) Roy, to CashOut. When he enters your referral code, he will immediately receive 50 coins. And once Roy collects 200 coins you will get 100 coins and 5% of all his future earnings. Cool, right? You can find your referral code on the "invite" tab. You can redeem your coins for cash or other various rewards. CashOut offers rewards for worldwide users. So no matter where you live you can easily get paid through PayPal. Some of the gift cards you can redeem are PayPal, Amazon, Big Bazaar, Walmart, Google Play, Xbox Live and much more. CashOut offers various reward options and a decent number of ways to earn cash. But most of the high paying offers are app download offers and if you are from a country other than Australia, UK, USA, etc. the number of surveys and offers available for you may be very low. But you can boost your earnings by referring (users who sign up with your referral code). Bannerizer makes it easy for you to promote ClickBank products by banners, simply go to Bannerizer, and get the banner codes for your favorite ClickBank products or use the Universal ClickBank Banner Rotator to promote all of the ClickBank products.